ON TINSEL & TINE'S facebook page. 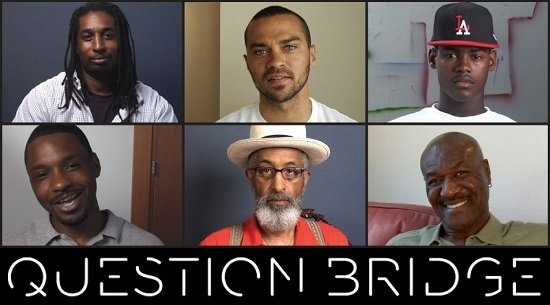 Question Bridge: Black Males is an on-going experiment looking at the black male from the perspective of the confessional. Almost 200 men of color were interviewed on camera asking a question, for instance: “What are you afraid of?” Then several black males of varying ages, hues, economic and educational backgrounds, watched the video of the question, and answered back to the camera. The resulting sociological experiment is very interesting, enlightening and personal. Some questions/answers were socially relevant – “Why do so many black men refuse to get medical check-ups?” Which brought one man to tears when he recounted losing his brother to prostate cancer, after repeated reminders to his brother to get a physical. Some questions/answers were humorous – “Does anyone else feel self-conscious eating chicken, watermelon or bananas in the presence of white people?” Which elicited funny anecdotes. Some questions/answers were deep – “Do you resent your single mother for having had you with a man that did not stick around to be a father? Which surprisingly, most men seemed to be taken off guard by the question, as if they never considered their mother's choice in the matter to be relevant. The Question Bridge format was made more engaging by keeping the faces of the men within a rectangular frame against a backdrop of black screen. Other rectangles of men would appear beside, above or below the answerer, as if listening, and then disappear or be replace by another listener or new answerer. All the questions were relevant to the experience of being a man of color and evoked surprisingly open answers from the participants; however, eventually, I felt a bit of tedium. I think the piece would be more effective with maybe 3 – 4 less question/answer segments. However, it's understandable that the co-directing team wanted to include as many participants as possible. Be sure to visit the website where the experiment continues - http://questionbridge.com . Hopefully the team is working on a Question Bridge: Black Females version. Click link to see an excerpt of the Blackstar Film Fest Question Bridge: Black Males Q &A post screening. 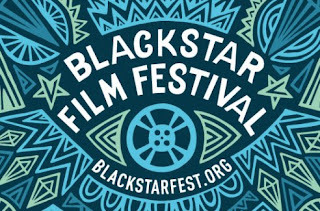 Philly welcomes back BlackStar Film Festival running Thursday August 1 - Sun August 4, 2013. Supported by the James S. and John L. Knight Foundation, the fest will screen 75 feature films, short films, and music videos representing four continents, along with a special awards ceremony, panels, concerts, receptions, and a screenplay competition. The festival will primarily take place at International House of Philadelphia (3701 Chestnut Street) with additional screenings at Drexel University (33rd & Chestnut Streets) and The Barnes Foundation (2025 Benjamin Franklin Parkway). 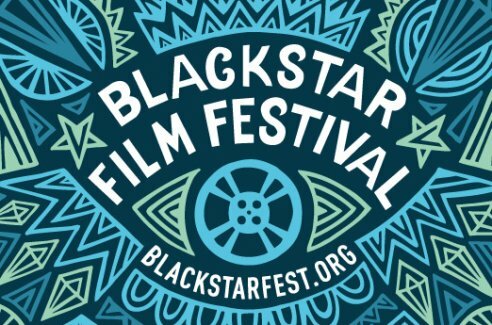 Dubbed the “black Sundance” by Ebony.com in its inaugural year, the festival has doubled in size and is already considered a must-attend gathering for filmmakers, industry insiders, cineastes, and critics. It is destined to become a launching pad for many of the most talked about films from the African diaspora. 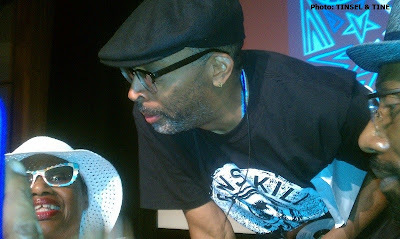 This year the festival will launch an awards competition and an audience awards component as well as a special honor for the Howard University Film Program, which will be presented to renowned director Haile Gerima on Sunday, August 4. Highlights include the world premiere of Wangechi Mutu’s THE END OF EATING EVERYTHING, the Philadelphia premiere of Andrew Dosonmu’s MOTHER OF GEORGE (Q&A with the director and director of cinematography Bradford Young) and David Tosh Gitonga’s NAIROBI HALF LIFE, as well as a special presentation of Victoria Mahoney’s YELLING TO THE SKY (Q&A with actors Tariq “Black Thought” Trotter and Yolanda Ross).